Beautiful Finca style property with fabulous views located close to Maserof and a short drive to the town of Jalon. This spacious property consists entrance into hallway, large lounge dining room with wood burner, door to naya summer room with glass curtains and patio doors to garden, double patio doors in lounge to open naya for al fresco dining with built in barbecue, fitted kitchen with valley views and separate storage pantry, master bedroom with fitted wardrobes, ensuite bathroom, separate walk in wardrobe, double bedroom with fitted wardrobes, separate shower room. There is also a separate wooden chalet on the land which includes large terrace, lounge dining room, two double bedrooms, kitchen area and bathroom with shower. 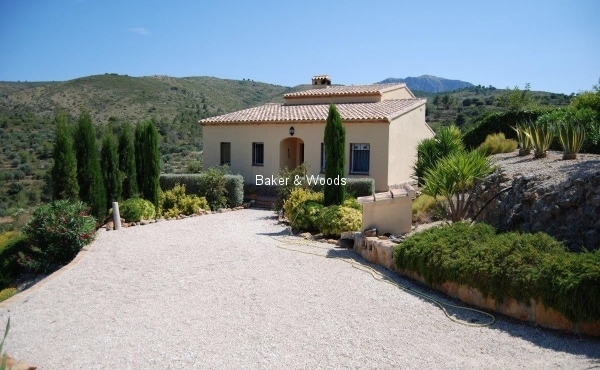 The property is located on 11,696m2 of land with numerous fruit, almond and olive trees, separate garage, outside storage and beautifully maintained gardens. The finca benefits from solar power electricity with diesel generator back up, under floor heating and pre installed air conditioning. Set in a stunning location with panoramic views this would make an ideal country retreat with the added benefit of separate guest accommodation. Viewing is essential to appreciate the location and many benefits of this wonderful property.